You may take an additional action during your turn, which can only be used on Tome [Action] abilities. [Elder Sign] effect: +0. If you succeed, draw 1 card for each Tome you control. Deckbuilding Options: Seeker cards ([Seeker]) level 0-5, Mystic cards ([Mystic]) level 0-2, Neutral cards level 0-5. 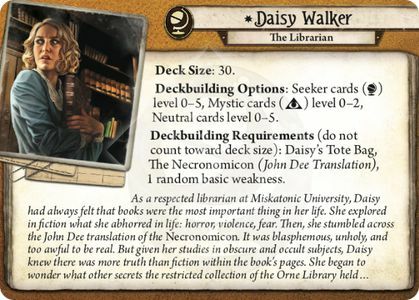 Deckbuilding Requirements (do not count towards deck size): Daisy’s Tote Bag, The Necronomicon (John Dee Translation), 1 random basic weakness. I don't think they count. That second rule you quote being the important one. 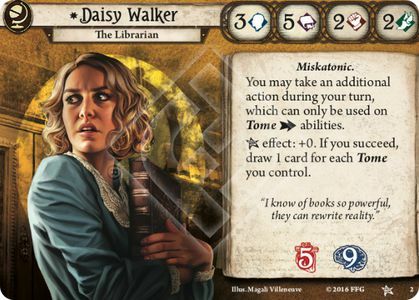 When doing the counting for the elder sign effect it can only count Tomes in play. Cheers. Yes, been playing that way (ie not counting in-hand, decal or discard) but after reading several discussions online wasn’t sure, and couldn’t see any clarification in FAQs or errata.